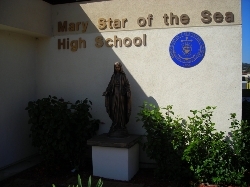 The Archdiocese of Los Angeles and Mary Star of the Sea Parish legally own Mary Star of the Sea High School. The governing authority consists of the pastor, appointed by the archbishop, and the rector and principal, both hired by the pastor. The governing authority of Mary Star adopts policies with the help of the Administrative Board, Principal’s Advisory Cabinet, Spiritual Formation Committee, Parish Finance Committee, Pastoral Planning Group of the Parish, Evaluative Council, Curriculum Committee and the Admissions Board. In addition to these committees, there is also a Parent Board.